Shari Querio, left, and Mark Quireo of Chewelah, Washington, donated $10,000 to the Spokane Red Cross office after learning about the Red Cross effort to assist clients affected by the Washington wildfires. 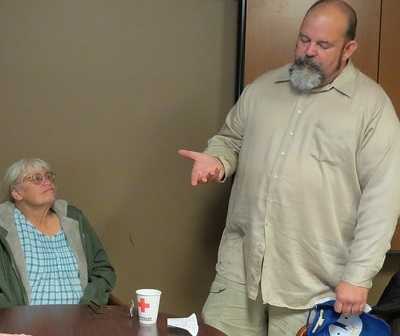 SPOKANE, WA (September 2, 2015) Mark Querio couldn’t believe his ears when some of his friends said they didn’t want to donate to the Red Cross. When Mark asked his friends why they thought this, they said that they’d heard that disaster victims were charged for the help they received. But Mark remembered his wife, Shari, telling him that when her house was destroyed by fire back in the 1980’s the Red Cross just showed up and helped without being asked. “People showing up out of the blue just to help scrambles your head,” she said, and she was so grateful for the help. Querio, who lives on a farm near Chewelah with 50 rescue horses, has a background in broadcasting. He also has a wide range of community interests. Larry went on to offer Mark a place to stay for the night, a shower, and a special meal to meet his health needs. Querio thought, “Why are they offering me all this?” He was so surprised and moved, he offered the shelter a $300 cash donation on the spot. When told that the shelter couldn’t accept cash, he went shopping, telling everyone he was helping the Red Cross, and hoping others would rise to the challenge. By the time he returned to the shelter, he had bought $500 worth of packaged food and supplies to donate. Still not satisfied with his efforts, a few days later, Querio and his wife walked into the Spokane Red Cross office with a check for $10,000, which they specified to be used for the Washington wildfires. Shari said her husband rarely takes credit for his philanthropy, but in this case, he is hoping others will help the Red Cross as they work to relieve pain and suffering caused by the recent outbreak of wildfires. He also plans to become a Red Cross volunteer. Mark…contact me on Facebook. I will tell you my story about evacuating and the Red Cross.